We are proud to announce our strategic partnership with Lovetree Co. Like Khusi Hona, Lovetree is based in Tampa, Florida in the U.S. but the real impact is happening on the ground in India. 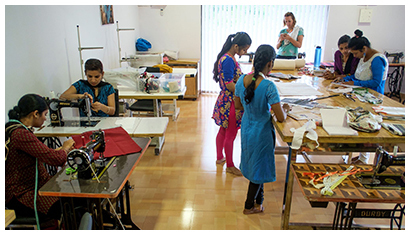 There are a lot of women empowerment programs popping up in South Asia, and the work they do is very important. When we decided we wanted to help tackle the issue of supporting and empowering women who come from difficult backgrounds, we wanted to take a different approach. You can learn more about the Khusi Hona women empowerment program here. One of the fundamental issues we have seen in other programs is a lack of skills development catered to the real market. Some women are being taught how to make handicrafts out of recycled newspapers or scraps of cloth and the finished products are sweet. Ultimately how many people want a fruit bowl made of rolled newspaper and what price will it fetch. If we are to offer real opportunities to truly empower women, we have to take a different stand. The trainings and opportunities that Lovetree Co. is offering in our programs are different in so many ways, including a culture of fun and inclusiveness. But most importantly they are setting real world expectations that can carry on to the professional world to all the women that are involved. 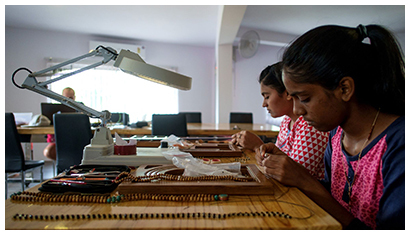 We are setting intensive quality control measures with every product we are producing for Lovetree Co. which in turn is teaching the women involved a valuable lesson on expectations of work ethic. Because these are not budget or low ticket products being produced we are able to provide a business model that is paying all the women in our program a fair wage. Beyond wages there is a greater value and a strong push to make sure all our program trainees continue their education whether formal or non-formal. 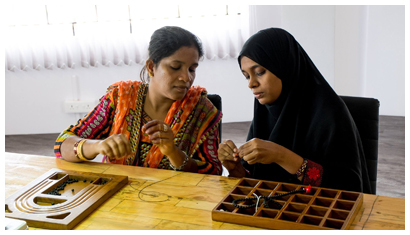 Ultimately without a retail outlet like Lovetree Co., we would be unable to offer the level and quality of trainings that we offer and especially creating a business model and income for the women involved. 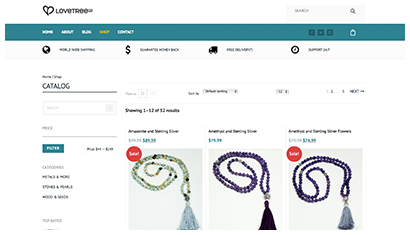 Currently Lovetree Co. is only offering mala inspired jewelry items with plans to release tailored clothing and accessories in the near future as training progress allows. Their slogan really says it all; Handmade with Love. Each ethical fashion item they sell comes with a story whether it be the material for their jewelry bags that were handspun and woven at a leper community, or each stone that was hand selected and knotted with love. Each piece truly enriches a life and allows for each trainee to be empowered. Best of all they are items you can wear and use everyday, this allows for the beautiful story to perpetuate. We invite you to check out Lovetree Co. at their newly published website here. They have just launched and have some really great items that are on introductory sale as well as a $5 off coupon for signing up to their newsletter. We look forward to this strategic partnership inspiring it’s customers and most importantly empowering all the women involved in producing each and every item they sell. Please be sure to check out their store and follow them on Facebook, Instagram and Twitter. About Khusi Hona: Khusi Hona’s mission is to empower vulnerable people with solutions to rise above their poverty. We are guided by a principle of social entrepreneurship and believe that breaking the cycle of poverty starts with tangible, life-changing opportunities. Learn more on our website.